learn what are isosceles triangles. In this lesson, we will learn about isosceles triangle. A triangle is an isos. triangle, when it has two sides of equal length. Now, to demonstrate this, let's move vertex C to the right. When these 2 sides have the same length, we get an isos. triangle. Here, the side BC will be the base of this triangle. Note that, since these 2 sides have the same length, these two base angles will also be the same. Let's move vertex C and vertex B. Notice that, we have another isos. triangle. Now, there is a right angle. Therefore, this triangle can be called right isos. triangle. Is this an isos. triangle? 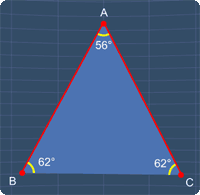 Since this triangle has 2 sides of equal length, this is an isos. triangle. Notice that, these two angles are the same. Hence, these 2 sides must have the same length. Hence, this is an isos. triangle. Last example. Now, all the sides of this triangle do not have the same length. Therefore, this is not an isos. triangle. You can start by going through the series of questions on isosceles triangles or pick your choice of question below.